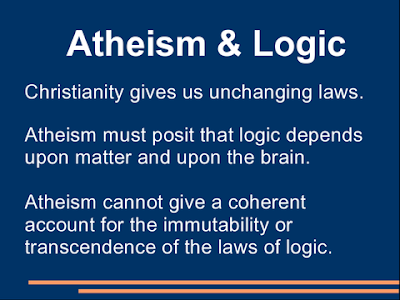 Just discovered this talk, with accompanying slides, which pushes the same atheism-bashing argument - atheists cannot allow for or justify logic and reason. The website is here. From there you can download the talk (mp3) and also the accompanying slides (example to the right). The author, David Anderson, is a creationist, and has a blog here. Supposing that this reduction could be carried out though, using as yet unfound explanations, what does that leave us with? Note the assumption that all atheists are materialists - indeed, crude reductive materialists. Bullfrogs usually croak in chorus. Of course! Naturally, we should take the word of a wannabe Christian philosopher with an axe to grind rather than actual biologists and cosmologists working on abiogenesis and cosmogony. Clearly, those sinful scientists lack the influence of the Holy Spirit. I mean, crap, they spend billions of dollars of research into abiogenesis and now with that billion dollar Large Hadron Collider at CERN, to find out about the conditions of the Big Bang. Don't they know they can get all of their information from just a website? What a waste of money! Well, it looks like we don't have empathy for one another. And why in the heck does this idiot think "We're working on that" is a worse answer than "The Magic Man done it!" Tragic, no less! Hmph! Methinks the Emperor's dangly bits are a wee bit too exposed to get much mileage out of pointing out that his critic's shoelace is untied. The argument that God is the creator of the universe, the cause of the validity of logic etc is very weak philosophically but very strong psychologically. We find the notion that "someone did it" satisfying in a way that the notion that impersonal forces were responsible is not. This satisfaction causes us to think we have found the answer. I have been very impressed by Stephen's efforts in this topic stream. However I think that to be persuasive we should be looking at the psychology. We seem to have lost Sye. I wanted to ask him if he knew about Godel’s incompleteness theorem and its implications for logic. Specifically, there will always exist the possibility of truths that can’t be proven true. And that also means, of course, that they can’t be proven untrue. Roger Penrose uses this as a premise for a book-length argument that artificial intelligence will never be able to quite do what we do (refer Shadows of the Mind). and everyone's favourite emotional blackmail, "Jesus loves you." Scientists may be as ignorant of how the universe originated as the fundamentalists, but dammit, we don't equate our ignorance with 'Godiddit'! Thanks for the link, Stephen! Not being a native UK speaker I think the word is presuppositionalist. Stephen - did you watch the C4 "Make Me a Christian" show at the weekend? It was a pretty dire offering as documentaries go but did highlight some of the psychological ploys being used. I suggest C4 might be a more worthy target than fringe websites. I agree with Paul Power that the psychological angle remains far more interesting than the metaphysical one. My own pet theory is that there are two psychological factors at play here: 1) a need for existential/teleological security and 2) the need for schema in which to process and categorize moral, metaphysical, and existential data. no missed it. do they repeat? Is it on-line? I was only under the impression that only certain formal axiomatic systems are not simultaneously consistent, complete, and decidable. The most obvious example is any system of arithmetic capable of producing all the propositions that hold of the natural numbers and the isomorphisms therein. However, there exist a number of complete, consistent, and decidable systems, unless I am horribly mistaken: Presburger arithmetic, propositional logic, and first-order monadic predicate calculus (i.e. predicate calculus lacking n-adic properties such that n > 1 | n is a positive nonzero integer) for some examples. So the incompleteness theorem seems to only apply to certain formal axiomatic systems, not all of them. Stephen asked: "no missed it. do they repeat? Is it on-line?" Doesn't look like it is immediately accessible. I gather C4 have some sort of TV on demand if you are with one of the cable co's or BT that has the last 7 days but I a too tight fisted to subscribe so I can't vouch for it. They seem to have some lips from the previous one "Make me a Muslim" but they don't seem to work on my browser. Maybe drop them a email in your capacity as an educator/author/philosopher? Or perhaps one of the other "minions" has a copy? About to watch Prof. Dawkins now of course. It's the implication of the theory that I'm talking about. It's true that Godel's theorem applies specifically to mathematical 'truths', but since mathematical truths are the most reliable, I think it would be fair to extrapolate it to other so-called 'truths'. My point is, in regard to Sye's argument, that absolute truths are much rarer than he assumes and that not everything that is 'true' can be proved. You apparently know more on this subject than me, with the examples you give. But there are other examples that demonstrate Godel's theorem, including Reimann's hypothesis and the Goldbach conjecture. Now, I'm confident that someone will eventually find a proof or disproof for Reimann's hypothesis, but Goldbach's conjecture is much simpler and one would think that if there was a proof it would have been found by now. It's always possible to find a proof, by the way, by using axioms outside the formal system one is considering. What if the Riemann hypothesis is itself the "proof" of some thing else? By that I mean that one way of looking at proofs is that they are shortcuts. By concentrating on some aspect of a particular field of mathematics we show some property of it to be true without having to do things a longer way, ultimately by enumerating all the possible cases and applying our test to each one. We still "allow" enumeration for small numbers of cases and indeed with the advent of computer assistance the number of cases has increased and it is becoming more acceptable. That being said I believe that proofs involving huge numbers of cases checked by computer are not seen as quite proper in some mathematical circles. sort of infinity (the Continuum Hypothesis). Is it possible that these unproven conjectures about integers are actually proofs of something relating to, say, irrational numbers - shortcuts in the sense that they have already reduced the problem to the merely countably infinite? I was only under the impression that only certain formal axiomatic systems are not simultaneously consistent, complete, and decidable. Your impression is correct, but you don't need 'decidable' here. Classical first-order predicate calculus is undecidable, but there are complete recursive axiomatizations of it. In fact, your system doesn't need to be that powerful in order to be undecidable. The propositional modal logic K is undecidable! There's a thread on a presupp. blog here talking about Plantinga's evolutionary argument against naturalism (EAAN), which in simple terms claims to show belief in unguided evolution as being self-refuting. I've only read a little bit about it, but understand a few philosophers have made a stab at responding to it in the past - was curious to hear what your opinion on this argument was Stephen (or anyone else who knows the argument/has a better knowledge of philosophy than I do for that matter). There's a discussion at Vic Reppert's blog here. Check out some of my comments and Mike Almeida's replies. Some helpful IIDB links here and here. You also mention Fitelson and Sober's paper, which is excellent. I know what a materialist is, but when tagged with 'crude reductionist' -- what does that add to the meaning? Perhaps you won't mind if I jump in to answer your question. A physicalist, or materialist, holds that everything which exists is either physical or supervenes upon the physical. What is true about the physical world determines all of the rest of the facts, if you like. If you could make a physical duplicate of our universe, you would have already made a duplicate simpliciter -- nothing gets left out once you include all the physical characteristics in your duplicate. That said, physicalists come in many different stripes. Reductionism, Functionalism, Eliminativism... to name just a few. One very striking anti-reductionist way of thinking is emergentism. The idea is that while mental properties, facts, and features of organisms can not be identified with, or reduced to, the physical features of those organisms, the mental characteristics of organisms emerge from their "physical" characteristics. I am in pain because my C-fibers are stimulated, but it is not the case my pain is nothing more than a case of C-fiber stimulation. Also, being a physicalist doesn't commit you to any particular view about the relationship between different sciences. A physicalist doesn't have to say that biology *reduces* to chemistry in any substantive sense. So, to answer your original question, the assumption is that all atheists are a certain kind of physicalist, one that naively supposes a certain kind of universal reductionism is correct. Of course, there are a variety of physicalist views available; and besides, whoever said atheists have to be physicalists? timmo - when theists claim that God(s) interact with the world does that not also make them physicalists? It makes God one - but he is said to be all spirit. Very confusing. Well that ought to be good enough for them then. Theists are not committed to physicalism by claiming that God sometimes intervenes in the physical world. Of course, they can be physicalists if they want to, say by adopting Spinoza's pantheism. Or, theists can be physicalists about more limited aspects of the world, say human beings. These are logically independent issues, I should think. timmo - Well this is perhaps the part I find difficult. If some thing interacts with the physical world how can it not be part of it? I could just about stretch to a one off act of creation at the beginning a la deism but to me an ongoing presence simply suggests that it is part of the natural world. Granted it's a part we don't know much about but then again our knowledge of some of the other parts of our world is a bit sketchy too. (e.g bits of quantum mechanics). What is it that disqualifies something from being part of the physial world? I wonder whether there might be problems (similar to those which dog Cartesian Dualism) with the theist position that there is a non physical but interventionist god. What is it that disqualifies something from being part of the physial [sic] world? Taken generally, this is an important question for physicalists, to be sure. One wants to demarcate what counts as physical from what does not. Barbara Montero writes about what she calls The Body Problem, and contends that we should answer some central questions about physicality before we tackle the philosophical mind-body problem. However, I think that traditional notions of God are paradigmatic cases of non-physicality or immateriality. God is supposed to exist, in some substantive sense, outside of space and time. Aren't physical objects usually thought to be located in space and time? If some thing interacts with the physical world how can it not be part of it? I don't see the justification or appeal of the claim that anything which interacts with physical objects must itself be physical. Why suppose that is true? I guess you're hinting at the so-called interaction problem for Cartesian substance dualism. Despite the fact that many people have taken this "problem" to show that Cartesian dualism is untenable, I can't help but think it is a very weak objection to dualism. But, yes, if there is a serious mind-body interaction problem for dualists (which I don't think there is), then there will be a God-world interaction problem for traditional theists. Yes that is what I'm getting at. I think there is a serious interaction problem but to thrash that one out is probably beyond the scope of this comment section. Descartes got it the wrong way round. He should have said "I am, therefore I think". Presumably this is what Sye's God says, the contrary being impossible!